Over 300 million tons of plastics are produced every year however, out of these only 10% plastics are recycled and rest are only increasing level of landfills. Rising pollution and awareness among consumers are growing the need for recycling technologies which can increase the production of recycled plastics and reduce the pollution cause by plastic waste. Governments are also taking several initiatives to promote the recycling of plastic wastes. For instance, under the Plastics Industry Recycling Action Plan (PIRAP) the UK government is aiming to increase the plastic packaging recycling up to 57% by the end of 2050. Currently over 5 million tons of plastic is used in the UK every year and nearly 29% is recycled or recovered. Moreover, several companies are also taking initiatives to reduce the plastics and implying advance plastic recycling technologies. For instance, under the Unilever Sustainable Living Plan, Unilever has targeted to increase their utilization of recycled plastic for packaging up to 25% by 2025. In 2015, across all the Uniliever’s manufacturing operations, the company sends zero non-hazardous waste to landfill which was a commendable approach towards saving the environment. Such initiatives are expected to embellish the demand for recycled plastics in the near future. Rising demand for plastics from various end-user industries and policies for the reduction in plastic waste by government are the market players to utilized recycled plastic products and thus propelling the demand for recycled plastics across the globe. 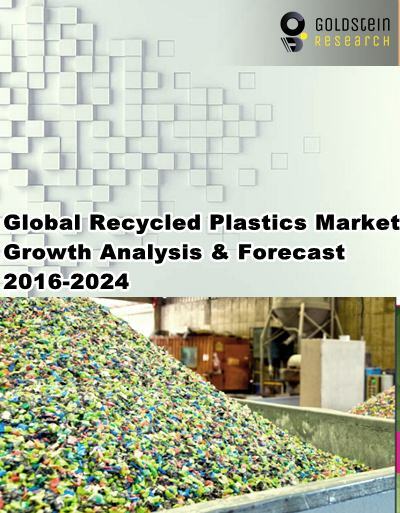 Global recycled plastic market valued USD 33.1 billion in 2016, and is projected to grow at a CAGR of 4.8% during the forecast period. Asia Pacific is the dominating region for global recycled plastics market and is estimated to dominate throughout the forecast period. In 2015, China imported 7.3 billion plastic scrap and contributes over 48% recycled plastics to the global plastic recycling market. Asia Pacific is the leading plastic scrap and countries such as China, Hong Kong, Malaysia, India and Taiwan contributes the major share. Constant enhancement in plastics management, rising public awareness and stringent policies increased the quantities of plastics for recycling by 67% in last 10 years in Europe region. In 2016, total waste collected in Europe reported over 27 million tons out of these 8.1 million tons were recycled. Countries such as Norway, Belgium Denmark, Luxembourg, Sweden, Germany, Netherlands, Austria and Switzerland successfully recovered over 95% of post-consumer plastic waste. Plastics can be easily molded into any shape and can be utilized in wide range of applications owing to its lightweight and durability. These features of plastic are increasing the import of plastic scrap and new scope for recycling thereby expanding the recycled business across the globe. In 2016, over 480 billion of plastic bottles were sold around the world. However, only minute share of recycled bottles are used to make new bottles. Companies such as Coca-Cola, PepsiCo, Danone, Suntory, Nestle and DrPepperSnapple only utilize nearly 6.5% of plastic for their products from recycled material. Less utilization of recycled plastics by food & beverage industry is likely to hinder the growth of recycled plastic market. One of the major challenges which plastic recycling industry is facing is mixed plastic waste and non-compatibility of various plastic products with each other. Moreover, complexity at collecting and sorting stage of plastics is also creates challenges in the development and recycling of plastics.